I love pastry. Offer me chocolate cake or a sausage roll and I will take the sausage roll every time. Or the vol-au-vent. Or the pie with the flaky pastry on top. I have read so many times that people are afraid of making their own pastry. Well perhaps not afraid, but more that they don't want to perhaps. The catalyst to my conversion was the first time I tasted the difference between a pastry made with butter and that made with margarine. I think that pastry has been only available to buy as a commercial product fairly recently. My mother and her mother and her mother and so on had always had a "rough pastry" in their repertoire : Rub fat into flour and bind with a liquid. The ratio of fat to flour dictated the shortness of the resulting pasty. The addition of sugar made the pastry suitable for a dessert. The liquid could be egg for a rich pastry or water for a plain pastry or orange juice for a pastry suitable for Christmas mince pies. The possibilities were endless. All you had to remember was cold hands make good pastry - or something like that. 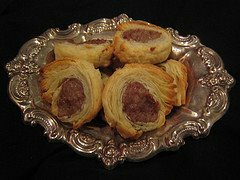 Pastry was originally used as a casing for a portable meal. A Cornish pasty is a famous example of this and a Bedforshire clanger another perhaps less known. The story of the Bedfordshire clanger is this : A pastry case was filled with one end a savoury meat mixture and the other a sweet fruit mixture. One end was marked for identification, both of the owner and the identity of that end's filling. The clanger was then dropped down the mine by the cook to her lucky husband at the dinner hour. I am not sure how well the clanger would have stood up to being dropped down a mine shaft - but that is the beauty of folk lore is it not? Rub half the weight of fat into a quantity of flour with a pinch of salt until the mixture resembles bread crumbs. Bind the mixture with the minimum amount of liquid required - add a bit at a time. Knead briefly until smooth. Do not handle or work the pastry too much to avoid strengthening the gluten in the flour which would make the pastry tough - we want tender. Wrap up and put it to rest in the fridge for half an hour. Roll out and use as required.